Any good pale lager will work well with this dish. The twang of beery bitterness balances with the sweet plumpness of the mussels. Taste the juices before serving; if the bitterness is too pronounced for your tastes, soften it by stirring in a touch of sugar. First clean the mussels: tip them gently into a sink half-filled with cold water. Examine the mussels one by one. Discard any that have broken shells, or that are open and refuse to close when tapped firmly on the side of the sink. With the others, scrape off any barnacles and pull away scraps of 'beard', then transfer to a colander. Once you have worked your way through all of them, empty the sink, then refill with cold water and put the mussels in. Swirl around gently, then take out the mussels, putting them back into the colander. Keep cool until ready to use. Cook the onion, garlic, chilli and coriander seeds in the butter in a large pan until tender, without browning. Now add the beer and bring up to the boil. Simmer for 5 minutes. Raise the heat high and tip in the prepared mussels. 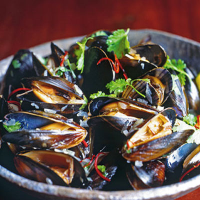 Clamp on the lid and shake the pan gently until the mussels open – up to 5 minutes or so. Discard any that stay shut. Squeeze over the lime juice and scatter with coriander, turn gently, then serve immediately. One could either embrace the Oriental side of this dish with Japanese Beer or the traditional Belgian one with a rich, creamy lager. It would make sense to use the same beer in the recipe.